After missing out on 95% of the winning moves over the last two years here in Belgium, I decided to get scientific about bike racing and find out how this stupid, stupid sport actually works. 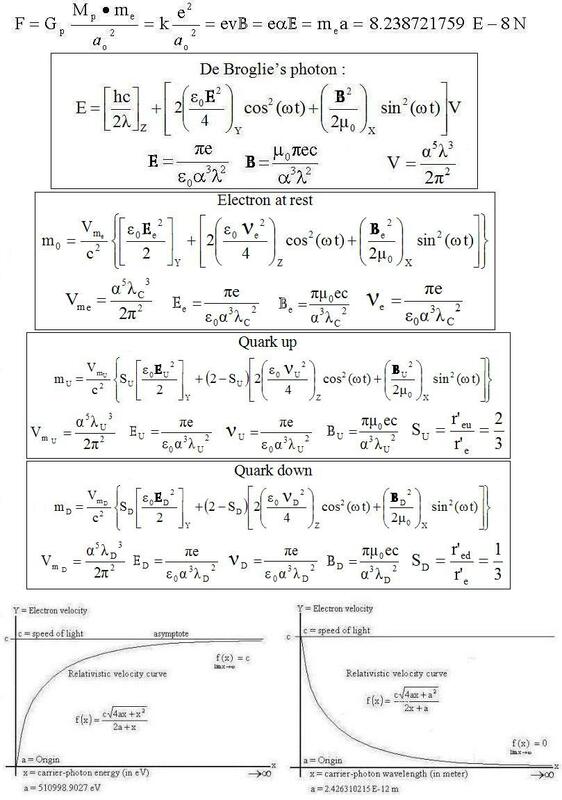 For my scientific and mathematical journey into the depths of bike racing strategy, I used a combination of Einsteinium algorithms and my vast understanding of quantum physics. The result: the winning move has a high chance of going late. This may seem like a given to many of you. A “no duh” if you will. But think, just think for a moment, please. Do you actually know this for a fact or is it based on assumptions? Have you ever gone to the trouble of solving this equation? Didn’t think so. Yeah, you didn’t, dummy, because you don’t poses the necessary skills. The truth is that both of these (very simple) equations are of the minutest necessity when it comes to figuring out how bike racing works. I did all the leg work though so you’re welcome. Here it is. Please use this knowledge for evil, not for good. Out of the 35 races I’ve done here in the past two journeys, I divided the races into three categories: flat, rolling, and climbing. Then I went back through my records and found out when the winning move would go: either first quarter of the race, mid way (the 2nd and 3rd quarters), the final quarter, or a pack sprint. The overwhelming evidence my equations proved true was that there’s roughly a 25% chance the move will go in the first quarter and over a 50% chance it will go in the final quarter, so there’s not much point attacking or following moves off the front in that middle portion of the race. I might as well attack hard for the first couple laps, sit in for half the race to conserve, then attack balls to the wall in the last couple laps. This is not what I’ve been doing. I’ve been attacking hard from the beginning until the final quarter of the race, then conserving for the finish. 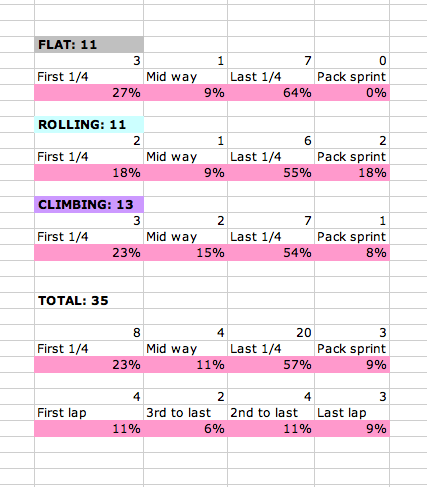 This is dumb because chances are that I’ll miss the winning move by doing this and things rarely come to a pack sprint here so why “conserve” for the finish if I’m not following the majority of the moves in the end, I’m not a sprinter, and the race won’t be decided by a pack sprint? If the break hasn’t gone by the last lap, chances are that it still will. Never wait for the pack sprint. It just won’t happen here, at least not in interclubs or non-pro kermesses. The last line shows which lap the move went on, though my records for this aren’t very accurate because many of the races I’ve done I wasn’t sure which exact lap it escaped, meaning the record isn’t complete and there are a lot more races where the winning move went on like lap two or three but I didn’t document it. But as you can see, the first lap and last couple laps (even with the record incomplete) make up 37% of the winning moves and that’s just a small percentage of the total race. The main thing to look at though is the TOTAL race category (35 of them) and realize that the final quarter of the race is the time to blow it all out. I did a race yesterday and again missed the winning move, this time on the very first lap. The move went right after I’d been up the road attacking with a couple others a few minutes after we’d been un-neutralized. Five guys went over us from the pack when we were caught and no one on their wheels responded in time. I attacked and followed moves and was off the front a lot for the next two thirds of the race, missed the next two moves that just rolled away as people looked at each other, and finished behind a lot of guys that I was stronger than. So the majority of my attacking was in that portion of the race that doesn’t really matter so long as you don’t get gapped off the back or crash. Race smarts will always beat strength or un-channeled aggression, and the problem is that the guys who get on the podium are both really strong and smart. Your mom could have told you that.